You cherish your bike. You invest in the maintenance of your bike. And with winter behind, it’s time to hit the open road. Whether you park your bike indoors or out, you need to secure and protect it from all the elements: sun, rain, bird droppings, or falling debris. 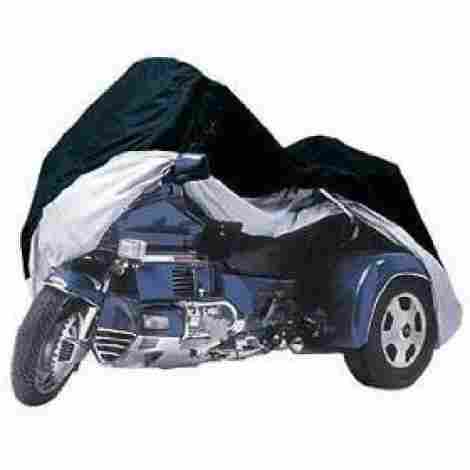 A well-made motorcycle cover is an indispensable item for every motorcycle owner to have. 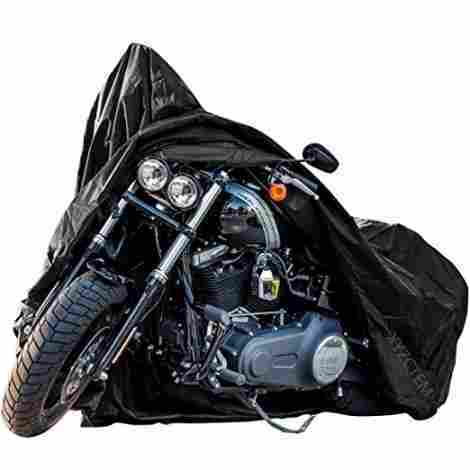 Our newest update reflects the best motorcycle covers available to purchase right now. We have removed some of the outdated covers and replaced them with the most up-to-date options. 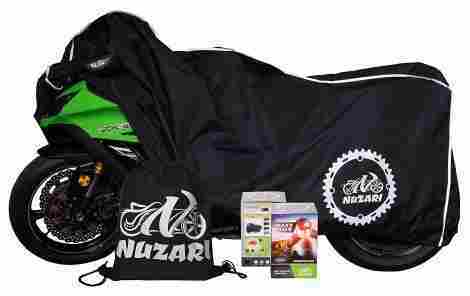 A motorcycle cover is an important accessory for owners to have and we take protecting your gear seriously! Sure you can throw a plastic tarp over your bike but those coverings are not sturdy nor waterproof nor breathable and will allow moisture to build-up and mildew to form causing rust. A well-made, breathable cover with securing straps will keep your bike secure and free of nicks, scratches, and dents, protect from the weather, and help to keep it running at optimal performance. Consider your specific needs when selecting a cover. Where do you most often park, in a garage? On the street? Do you street park in a high-density city neighborhood where cars might bump it while parking? Reflective strips will help make your bike more visible to other vehicles at night. Secure straps can keep the bike from tipping over in strong winds. And while everyone knows the damage that rain can do, too much sun can also cause damage so be sure to look for a cover that offers protection from the sun’s UV rays. And of course, none of this matters if your cover is not the right size or fits too loose. 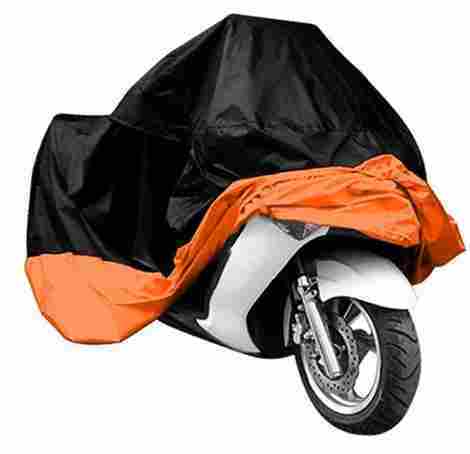 These 10 motorcycle covers offer a range of features and come in a range of prices. So how do you know which one is right for you? Don’t worry. We’ve got you covered. An industry leader, the Dowco’s Guardian line of covers are known for their top of the line construction and performance. Their covers come in many different sizes and specifications but the 50124-00 Weather All Plus Indoor & Outdoor Cover is our top pick, offering heavy duty, waterproof protection against all the elements indoors or out - and in any climate year round. Cover features a sewn-in hole for the wheel lock to pass as well as sewn-in alarm pockets to use the Dowco Cover Alarm, both adding a measure of extra security. Soft cotton is used under the cover to protect the windshield from scratches. This cover offers top of the line quality and a higher price tag to go with it. But paying for quality that can protect and secure your bike will save you money and time in the long run. If you’re going to call something badass, it needs to live up to that name. This high quality, high performing attractive cover from another well-established brand has several great features that set it apart at a midpoint price range making it an attractive option and well… pretty badass. There’s a difference between water resistant and waterproof. This cover is fully waterproof with taped seams, elastic and a buckle to keep the cover on and your bike dry. Night time reflective safety stripping will make your bike visible which can help you avoid dings and dents from other vehicles parked in the vicinity. The combination of its protective and securing features, attractive look and mid-price point makes this a high-value option relative to cost. There are several models from this reliable brand that are all good choices. 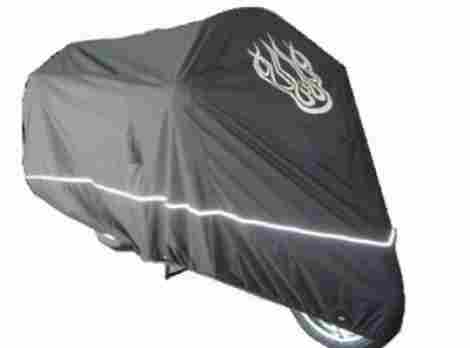 This particular heavy-duty all outdoor cover features an innovative design icon on the sprocket side of the motorcycle winter cover, so you won’t have to guess whether it was installed properly to cover your bike. Its heat shield makes it an optimal choice for those living in hotter climates. This cover has air vents built into it to make it breathable and also it deters water to build up under the cover which can prevent mildew formation. The Interior Heat Shield Heat prevents the cover from burning or melting in the heat. This cover has a Heat Rating of 150 degrees. Another mid-range cover with excellent protection against a range of weather conditions including excess heat. Definitely offers high value relative to cost. This XXL cover can fit bikes up to 108” in length and comes with some very nice features like backpack carrying bag to store it. It is water repellent and water resistant if not quite waterproof so that is something to keep in mind for those planning to store their bikes outdoors. To transport your cover, simply fold it up and put in the carrying bag so that you will have it when you get to your destination. 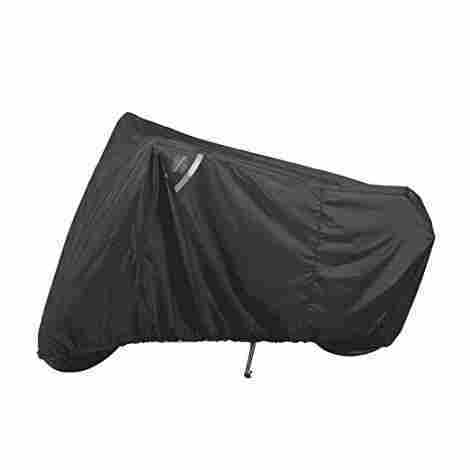 This very large cover will fit a variety of bikes up to 108” and has a snug fit for sturdier protection. This is an inexpensive cover yet has similar features and a similar well-built construction to much more expensive covers on the market making it a very good buy. This medium sized cover sports a lot of bells and whistles and offers very good all-weather protection. 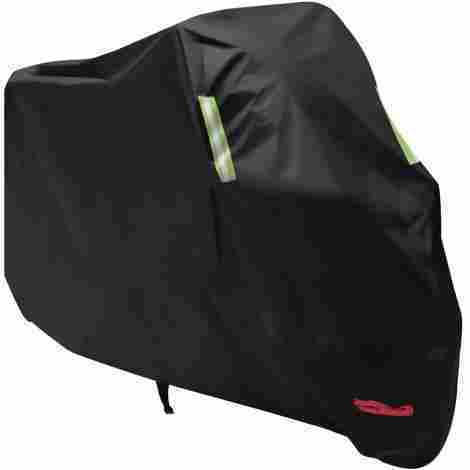 Sewn cut-outs for locks and chains, elastic bottom and straps for extra securing, and air-proof vents all combine to make this a very sensible cover choice for up to 90” bikes. Cut-outs sewn into the cover allows locks, cables, and chains to easily pass through when locking up your bike. Waterproof air vents allow air to pass through so your bike doesn’t tip over from strong winds. Very high cost to value ration due to the product offering a range of important features at a mid-price point. Don’t let its low price fool you. This is a high-quality cover that offers strong waterproofing protection as well as protection from the sun’s damaging UV rays and doesn’t fade. Performing as advertised, with much to recommend it, this cover is deservedly our best-value pick. One of the most advertised claims of many covers that often falls short, the Anglink uses 210D Oxford Fabric for true waterproofing protection for your bike even in a heavy rainstorm. Built with anti-ultraviolet functions, and due to its unique dyeing process, its sleek and attractive black color won’t fade. Less expensive than many of the covers we’ve looked at, it nonetheless delivers on important features and performance. This is a high-quality cover at a very attractive price point, giving it an excellent cost to value ratio. This is another large cover that fits bikes up to 108” in length. It’s packed with a variety of important features and accessories and made from a durable heavy-duty material. It has a reflective band and comes with a cable and lock. Best of all, it ships very quickly so for those with urgent needs, this brand comes through. Premium high-quality durable cover made of heavy-duty 300 denier polyester fabric. The seams on this cover are all double top stitched with nylon thread and heated seam sealed for stronger protection against a variety of elements. 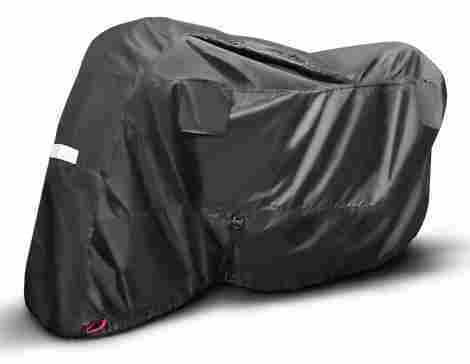 This is a higher end motorcycle cover from a very reputable brand and it does deliver on features and performance giving it good value. This sharp and attractive cover is a solid choice at an equally attractive price point. It’s made from very durable heavy duty fabric, fits most brands and models of bikes, comes with a free storage bag for convenience, and offers a 100% money back guarantee if not satisfied. But we think you will be. The cover boasts an attractive and sleek, black design setting it apart from the rest. Another attribute of its design is that with no elastic continuing all the way around, it’s very easy to put the cover on and remove it without hassle or wasted time. While not the least expensive on our list, it is in the lower range. But its attractive and smart design gives it a performance you’d expect from higher end models, offering high value for the price. A no-frills lightweight and super soft cover that is quickly starting to gain notice. Though lighter than other covers it still offers very strong protection against rain, heat, UV rays, dust and all sorts of extreme weather. Very well made material ensures strong protection against a host of elements indoor and out. The purchase of a cover includes a kickstand and a storage bag for no extra cost. It’s convenient to have a storage bag to easily transport your cover with you wherever you go. This is another cover that falls in the lower range of pricing but delivers a very strong performance and excellent features. This highly rated cover offers excellent value for the cost. For those on a tight budget, the Leaning Tech All Season Waterproof Sun Cover comes in as the least expensive cover on our list. But large, lightweight and all-purpose, it fits a variety of bikes including those up to 108” and is quick and easy to install. If you want budget prices without sacrificing quality this is a good option. Designed to fit a wide variety of makes, models, and sizes of bikes including large ones. Lightweight and breathable, it offers good air circulation. At a rock-bottom price, it doesn’t come with the same quality of performance as some of the others on this list, but it does still offer a wide range of features and solid protection. If you’ve ever had the misfortune of your motorcycle being hit while parked then you already understand why this is important. Having a reflective quality to your cover doesn’t just make your bike easier for you to spot. It also provides a warning beacon to drivers who may otherwise not see your bike in a tight spot. Which brings us back to the original point: if it’s happened to you, you already know. For those of you who have managed to luck out, stay tuned to see what we mean! Parking lots can get pretty dark. Some of them have low-lighting, but for many there’s really no lighting at all. We’ve all made the mistake of almost pulling into a spot where there’s a bike we weren’t able to see at first. That’s an easy mistake to make! Uncomfortably easy, in fact. That’s why you need to make sure cars can see your bike in any lighting. This applies to pretty much anywhere you can park your motorcycle, honestly! It’s never a bad idea to increase your bike’s visibility when you can’t be there to watch it. Nobody wants to buy a product that won’t last. There’s a certain amount of pride, after all, in owning a well made product that you know will survive years of usage. Having a durable product means having a product you can depend on. There’s no two ways about it! This list features multiple products that will sustain through whatever abuse you throw at them. Although the limits of each one are different, you’ll find that they all pretty much past the test. Durability doesn’t just refer to the ability to withstand what you yourself can throw at it, however. You also have to take into account the outside elements that make it that much harder for a product to stay in tip-top shape. The sun, for example, sends out UV rays that can be damaging to the leather of your bike. You want a cover that’ll block those out! There’s also waterproofing to think about. There are a ton of features that make up the durability of a product. At the end of the day, we think you’ll find this list to have the best of those products on it. Hate waking up to a wet bike? Tired of drying off your seats anytime you want to go somewhere? Aggravated by low quality products that just don’t seem the cut it? These are common complaints, especially for those living in a more humid environment. There are parts of the United States that experience ridiculous amounts of rainfall. You can bet that this still doesn’t stop them from riding their motorcycles, though! Seriously, there are some places in the United States that can get up to fifty inches of rain a year! That’s a pretty insane amount, and definitely more than a motorcycle can handle without protection. Beyond that, there are still other regions that have their own worries. Are you from the northern United States? Then you know that snow is a huge problem for the owners of bikes. If you want to keep your bike outside in the winter, or just don’t have room indoors for it, a waterproof cover is essential. There were just too many reasons to make sure waterproofing was a huge part of this list! Have you ever found a phone case that was great but didn’t fit your phone? It was heartbreaking, right? Well, that’s kind of how it feels when you find the right cover in the wrong size. It’s the aggravation of ordering a product, only to realize it just doesn’t fit once it shows up. The hassle of packing it back up, sending it back, and ordering a new one is something everybody would like to avoid. Because of this we took a “one size fits all” approach to this list. You’ll find a large array of products built for almost any bike! From there you just figure out what other features you’d like. Boom, bada, bang. It’s seriously that easy! Guesswork is a thing of the past because we did all of the messy guesswork for you. Of course, you still want to take the measurements for your motorcycle. Since they all have a range of size you’ll need those numbers no matter which cover you choose to order! We think it just helps to know that there are so many options to choose from, and they all probably fit your bike. This criteria is almost essentially the opposite of waterproofing. You know that you want a cover that’ll be leak-free, but did you know that you need protection from the sun? Finding a heat resistant cover is probably the most important feature for southerners to look for. This goes especially for those of you who live in crazy hot environments! If you live anywhere near a desert, for example, this is a non-negotiable bullet on your list. Do you know the dangers that UV rays can pose to your bike? For starters, they can do some serious damage on the leather, whether it’s on the seats or the details. It’s been pretty well understood for a while that leather fades over time when it’s exposed to sunlight. The right bike cover can help your motorcycle look new for years to come, no matter what kind of environment you live in! Desert sun: 0. Prepared motorcyclist: 1. That’s completely up to you! Or, rather, your bike. 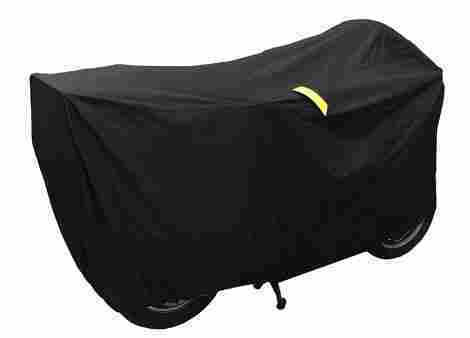 You want a cover that’s going to cover your entire bike, but will fit snugly around it. There’s a sweet spot right in the middle between those two characteristics. On one hand, if it’s too snug it’s hard to take off. On the other hand, if it’s too large it won’t really offer as much protection. We suggest starting with taking some simple measurements on your bike, and then go from there according to the directions the seller gives. They should be able to help you find just the right one for you! Q: Why should I cover my motorcycle? Well, for starters, you love your bike. You know that your motorcycle means way more than transportation. It means freedom, relaxation, and a get-away as soon as you’re on the open road. It’s like a mini vacation on wheels. You want to make sure that your bike gets the best possible care, so why should storage be any different? While it can seem like a small detail you should keep in mind that motorcycles are easier to damage than regular vehicles… and even regular vehicles get covers! It really just makes sense that you’d keep it covered. 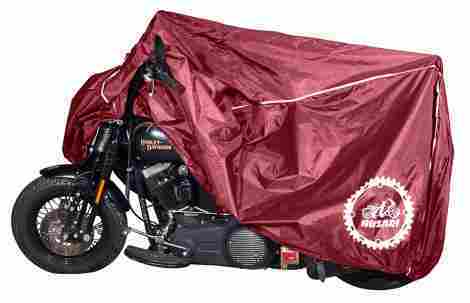 Q: Are motorcycle covers easy to clean? In general, yes. Most of them are pretty easy to hose down, and then dry in the sun. Some are washing machine compatible, and should be cleaned thoroughly that way. The seller should have adequate information on how to maintain their specific product. If you still have questions, they’re the people to go for figuring out how to keep your cover clean! There are also plenty of products out there that are specifically formulated for cleaning your motorcycle cover. There are even sprays you can use for added protection! It’s a whole world filled with new toys, so make sure to order one of these covers, and experience it yourself! Q: How can I keep my paint job from getting scuffed? Glad you asked! This is a big concern of so many motorcycle owners. It’s a good general question to have answered, and can really save you a lot of tears. Covers offer more than just protection against the elements. They can also keep your motorcycle free of scratches! No matter where your bike is being stored, or how many sharp edges are around it, it’ll be safe from harm. While we don’t recommend bumping into your bike on purpose, you can rest assured that when an accident happens you’ll breathe easier. There is really no debating the answer to this question. Yes, yes, yes! Absolutely. Remember how these products can keep your bike safe from scratches? Now, think about how many sharp edges are in a garage, and how many dangers there are to your paint job. Pretty easy math that points to you needing to get a cover on your bike ASAP! You’ll also save a lot of time on dusting, as well, since the motorcycle cover will keep dust from settling on your bike. Covers are multi-use tools that you’ll find convenient in almost any situation. Also, if you have a cover, you can just go ahead and keep it outside anyways! That’ll free up storage in your garage for so many activities!. Q: Does the material matter? Absolutely! You’re going to want to look at materials that wick off rain, and can stand up to extreme conditions. Even if you don’t exactly have “extreme” conditions where you are, it gives you peace of mind knowing that your cover can take literally whatever is thrown at it. You also want a material that will block out UV rays, since those can be incredibly damaging to leather, as well as your paint job. There’s also the softness of the material to consider. You definitely want to get a cover that is soft enough to keep from damaging your bike, or leaving any scuffing behind. The list of products above is filled with great options that cover pretty much all of these bases! You should never underestimate the importance of a good quality cover for your motorcycle. Too often riders invest time and money to have the best set of wheels but then cover it in a flimsy, plastic tarp that can’t hold up to the harsh weather conditions, sun, and ultra-violet rays that bikes parked outside are exposed to, not to mention the dings, dents, and nicks caused by drivers of cars who overestimate their parking abilities. Flimsy covers lacking straps and elastic hems will not protect your bike from being knocked over and damaged by high winds. Water can become trapped between the bike and the cover if the material is not waterproof, which will allow mildew to form causing rust. Even for bikes stored indoors, dust and other pollutants can wreak havoc on your bike. It’s worth purchasing a well-made quality cover that will help ensure your bike looks and performs its best for many years to come.